I’m not a “get down on the floor and play blocks” type of mom. I do get on the floor and play wth my kids, but I much prefer reading to them or playing music. In fact, many of my fondest memories are of the music that we “create” by bashing on pots and pans or using the egg shakers. My kids and I always have the best time playing with the music basket. We recently got an iPad, which means all of us have had fun discovering apps for iPad. I was asked to review a music app. Since music is a big part of our lives, I knew that this would be a hit with the kids and I was right! Mibblio is the first interactive musical/storybook app of its kind. Mibblio has an easy-to-use intuitive design. In addition, Mibblio creates a world where children can read, sing, learn and play music all at the same time! 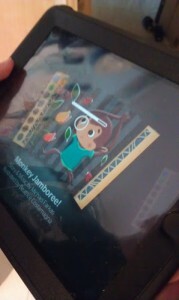 Musical Book App for Kids from Mibblio on Vimeo. Inside Mibblio is a world of beautiful mibblets. Mibblets are illustrated story-songs that invite children to read, sing, and jam while understanding the layers of developing music. My son wasted no time playing music on the keyboard that is part of Mibblio. While tapping at the keyboard with one hand, he was also able to strum a banjo with the other hand. I even had a go at the keyboard on the Mibblio! I saw how my son was able to listen to a song, then build upon a song. Meanwhile he was also having fun and improving reading skills,which is a double whammy in my book! Mibblio features classic songs like “On Top of Spaghetti” and “The Wheels on the Bus.” How many times have I sung the Wheels on the Bus?!? And I have to say that I smile whenever I think about singing that song. Mibblio features new sonsg like “Monkey Jamboree.” These new songs are written, illustrated, sung, and performed by accomplished artists such as Grammy-nominated mandolinist, Andy Statman and Grammy-winning drummer Marty Beller. New and old songs make Mibblio a hit with my son. He was qucikly able to download the app. Once downloaded he selected the instruments he wanted as well as the songs. There was a moment when I spied the unattended iPad and started playing with the keyboard. The sound I made was quite melodious…if I do say so myself. At one point, my son and I were playing a “duet” of sorts…he on the keyboard and me on the banjo. I like that while playing with Mibblio children are understanding the layers of developing music as well as learning the basics of creating a song. Here’s what you need to know about Mibblio. Mibblio is available for the iPad. Mibblio is recommended for ages 4 and up. You can download the Mibblio app from the Apple App Store with one mibblet included. I was compensated to write this post. I was given an iTunes gift card. The views expressed in this post are my own. I follow the tenets of Blog With Integrity.